Maharaj Dileepkumar Thankappan | Institute for Peace and Leadership, Inc.
Dileepkumar Thankappan internationally known as Avadhuta H. H. Jagat Guru Dileepji Maharaj (Spiritual Name) and otherwise known as “Guruji” is a world renowned Yogi from Tripunithura, Kerala, India. 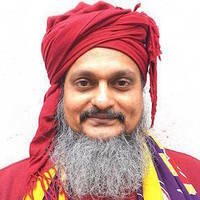 His Interfaith family is ancient and well respected for its Vedic knowledge of Yoga, Vedanta, Universal Spirituality, Kalaripayattu (origin of martial arts), Ayurveda & other natural self healing systems, Sanskrit, Literature, Art, Social & Cultural activities and Interfaith teachings for Peace and Harmony. Guruji was a spiritual traveler from his young age, In his yogic life journeys, he met and learned from self-realized Himalayan masters, saints, honored yogis, Sidhas from South India, artists and alternative medical doctors including Jagatguru H. H. Swami Bua Ji Maharaj (lived over 120 years) whom Guruji lived with and took care of his last days in New York City and received countless blessings. Having experienced yogic life style for over 45 years, Guruji lived in Himalayan caves, ashrams, and palaces as well as living under Gurukula (guru-sishya-sambradaya), and modern educational systems. Guruji is an ordained Interfaith Minister, Grand Master of Yoga, Humanitarian, Spiritual Guru, Artist, Dancer, Kirtan & Bhajan Singer, Musician, Sportsman, Martial Artist, Global Culture of Peace Activist, Traditional Healer and much more. He is a traditional doctor in alternative Medicines, received PhD in Alternative medicines in India. Additionally he received few honorary doctorates in divinity, theology and religion. He is one of the seven people started the global movement for the “International Day of Yoga” in 1988. Over 30 years he is organizing numerous global festivals, meetings, gatherings, training, events, workshops and classes on Yoga, Meditation, Interfaith & Inter-religious dialogues, Gender Equality, Universal Spirituality, Global Culture of Peace & Harmony, Ayurveda, Natural Self Healing Techniques, Vedic Teachings of India, Human Values & Rights, Global Citizenship, Total Literacy, Gender Equality, Non-violence, Healthy Living, Environmental Protection, Climate Change, Oneness Wisdom Fellowship, Universal Spiritual Fine Arts and Sports, Global Social, Cultural & Economic Development, Indigenous Knowledge and Sustainable Development and Eradication of Poverty. He is the founder and President of World Yoga Community Inc., International Gurukula Community, Inc. and International Gurukula Community Charitable Trust which are Not-For-Profit Organizations established in New York and India. He is involved with numerous non-profit organizations in different parts of the world including NGOs from the United Nations. Guruji is an honorable guest speaker and performer on spirituality at the United Nations, all Borough Halls in New York City, international conferences, events, and judge in global yoga competitions & festivals. He is considered to be a new age celebrity yogi and humanitarian having multifaceted talents and a wide range of friends from homeless people he serves to diplomats. He is a NGO representative at the Economic and Social Council (ECOSOC), United Nations. He received numerous peace, Interfaith, cultural and religious awards and titles from international organizations including from affiliated NGOs at the United Nations for his yogic services to humanity. He often gives discourses and is interviewed by media around the world. His mission is to cultivate global peace and harmony through yogic life teachings. Guruji is an Ambassador for Peace with the Universal Peace Federation, USA.